“Agave provokes bitter debate as a sweetener,” reads the headline in the March 23rd Chicago Tribune: www.chicagotribune.com/features/chi-0323deardorffmar23,1,7478086.story. The story raises questions about the safely of the trendy, expensive, liquid sugar made from the Mexican agave cactus. Agave nectar is being marketed as a healthful, all-natural substitute for sucrose because it has a very low glycemic index and doesn’t raise insulin levels. However, the dangers of fructose are well known, and agave nectar is almost 100% fructose. As I wrote in this previous post, http://carbwars.blogspot.com/search?q=agave, fructose raises triglycerides, promotes belly fat, and contributes to fatty liver, obesity, diabetes, heart disease, hypertension, and metabolic syndrome. It increases the formation of glycation end-products, which speed up the aging process. – It can contain botulism spores and should not be given to babies. – It should be avoided if you are pregnant, as some believe it can cause miscarriages. – It can worsen acne and diabetes symptoms. – It does not raise blood glucose levels, but it raises blood fructose, which is worse. – Use only agave nectar that is organic and carries a USDA seal. 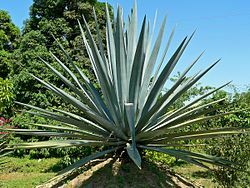 The author states that although the FDA does not see a need for action, it requests reports of adverse effects from agave. Agave Dangers. Miscarriages, Botulism, Fructose. Bookmark. Hi! This is my first time here, and I thought I’d give my 2 cents. To me, your post above seems very one-sided. I’ve actually contacted a few of the agave manufacturers who told me that these are some of the rumors they battle against because they take sales away from synthetic sugars and cane sugar. Anyway, just thought I’d contribute since I thought you’d welcome some personal experience. Yes, I do appreciate your sharing your experience. You are probably right that “moderation” is the key. However, I think it is important for people to realize that fructose is fructose whether it comes from corn or from cactus. You are kidding me! I looked at the recipes posted, and you promote the use of toxic chemicals in the recipes, yet talk about agave?! Crystal lite drink mix is all chemicals, that are toxic for the body. Mia culpa on the Crystal Light. It contains aspartame, and I don’t recommend the use of aspartame. I think there is another brand of lemonade mix that would be a better choice, but I’ll have to find out what it is. Read my other posts about sweeteners here: http://carbwars.blogspot.com/2007/10/sweeteners-update.html and here: http://carbwars.blogspot.com/2007/07/sweeteners.html for more information about agave and other “natural” sweeteners.